LOUISVILLE, KY —- University of Louisville Men’s Basketball Head Coach, Rick Pitino, has been welcomed by KFC Yum! Center and AEG to speak at the Robbie Valentine Summer Basketball Camp. The camp takes place July 27-30 from 9 AM-3 PM. Coach Rick Pitino will be making his appearance to express the importance of learning the fundamentals of basketball as well as having some fun with the campers. Source: WLKY.com. The Robbie Valentine Summer Basketball Camp will allow boys and girls ages 6-14 to learn useful techniques and skills to further their basketball careers all while having fun. The week will include instruction from experienced coaching staff including: Robbie Valentine, Darryl Murray, Gary Valentine, Brooke Valentine, and Jody Thornsberry. As the week progresses, the campers will have guest appearances from Denny Crum, Luke Hancock, Milt Wagner, and more. 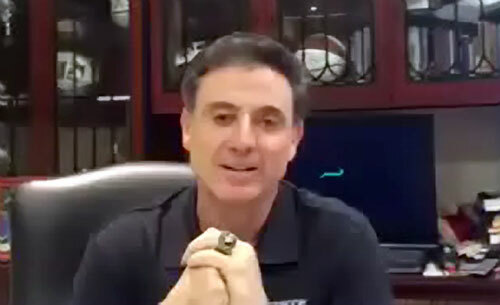 Rick Pitino is the head coach of the Louisville 2013 N.C.A.A. champions. He is the only men’s coach in N.C.A.A history to lead three different schools to the Final Four. In 1987, Pitino became head coach of the New York Knicks. The year before he arrived, the Knicks had won only 24 games. In just two years, Pitino led the team to their first division title in nearly twenty years. On April 8, 2013, Pitino became one of seven inductees elected to the Basketball Hall of Fame, just before winning the 2013 N.C.A.A. title. Rick Pitino is also a dynamic motivational speaker. Sports Speakers 360 is a booking agent for pro athletes. If you would like to book Rick Pitino for a speaking engagement, appearance or endorsement, contact Rick Pitino’s booking agent for fees at 1.855.303.5450.